The Kimberley has got a long history of indigenous inhabitation, white exploration & settlement. The region’s history could easily fill a book and is utterly fascinating. A snapshot of the Kimberley’s history will be given in this article. It is believed that the first humans that came to the Kimberley arrived from the Asian side of the Torres Strait. They saw smoke rising from lightning strike- fires on the Australian mainland, and therefore knew that there had to be fertile land. They are likely to have used bamboo rafts or log canoes to cross the water, the distance being estimated at less than 100 km at the time. Indigenous inhabitants are believed to have arrived in the Kimberley between 45,000 and 60,000 years ago. 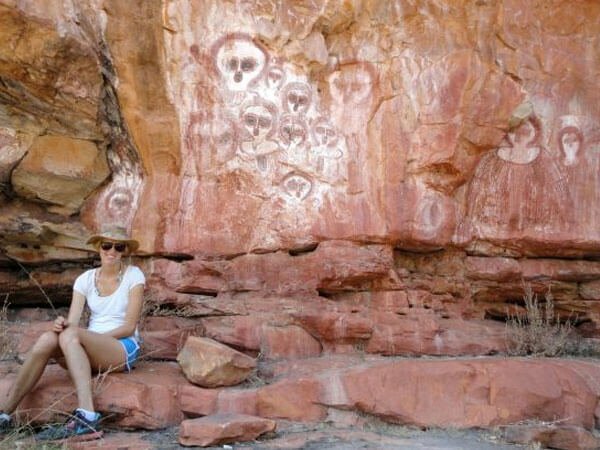 Extensive research is currently being undertaken in order to date aboriginal artwork in the region that could scientifically prove this estimation. More information on this is available on the ABC News website here. White settlement in the Kimberley Region was initiated by early European explorers through their explorations via land and sea. After Matthew Flinders and Phillip Parker King chartered and named the Kimberley’s coastline, the first exploration on foot, sent by the British government, was led by George Grey in 1837. The first attempt of settlement in the Kimberley was undertaken by sheep farmers at Camden Harbour. It was unsuccessful due to challenges such as the climate, distances and the harsh nature of the land. Hostilities with indigenous inhabitants also played a role, but were not the primary reason for giving up settlements. In fact, many attempts of exploration of the area were given up, or diverted from their original path, because of factors such as heat, lack of water and natural obstacles that could not be circumvented. True settlement within the Kimberley Region only occurred with the gold rush of Hall’s Creek in 1885, and the arrival of pastoralists from all over Australia. In 1879, Alexander Forrest had returned to Perth from an exploration of the Kimberley and reported the land to be most favourable for cattle farming and settlement. He had also observed a large number of aboriginal inhabitants, who he thought would be useful to serve white settlers. Forrest totally ignored the indigenous inhabitants’ heritage, the variety of existing kin and language groups and the deep spiritual and ancestral connection of the original inhabitants to their land. For the local aboriginal groups, the land was sacred and of importance culturally and in terms of resources (as it still is today). Concepts of propriety and land tenure were completely foreign to them. Land, animals and humans all belonged together. Yet, in 1881, the Government of Western Australia gazetted the land that Forrest had explored previously for the use of cattle farming, with no consideration of its Indigenous inhabitants. Forrest set himself up as a land agent, recruiting land investors from all over Australia. By 1882, over 44 million acres of land had been leased to 77 people by the Lands Department. The initial gazetting of land parcels for pastoral use still determines land tenure in the Kimberley Region today. The pastoral industry is now one of the Kimberley’s main industries, and certainly something the Kimberley is known for nation wide. Pastoralism in the Kimberley is now more successfull than ever. The demand for live export has been steadily growing since 2003/ 04; the main export market currently is Indonesia. 85% of the total value of agricultural production in the Kimberley was generated by the sale of livestock in 2011/12. Pastoral leases account for over 30% of the Kimberley’s land tenure. For tourists, the Kimberley presents an opportunity to experience remote station lifestyles. Many stations offer accommodation and other services, while still pursuing their cattle activities. When pastoralism was first introduced to the Kimberley, Indigenous inhabitants who lived on the land allocated to cattle stations often had to leave to make room for pastoralists, unless they were employed as station workers. At the stations, indigenous employees were paid with food and clothing, and often close family members were able to stay with station employees on their land. The ability to stay on their country and care for their land and cultural sites and to pass on cultural knowledge to the next generation was, and still is, very important to Indigenous people. With the introduction of equal wages in 1968- 69, many aboriginal station workers were made redundant and had to leave station leases, leading to even more indigenous people being removed from the cultural ties to their land. Indigenous inhabitants were also often placed in missions that were established by white religious settlers. Until today, a strong desire persists for many indigenous people from the Kimberley to return to their land and to practice their tradition, law and culture. Indigenous groups strive for independence and self-determination. An essential cultural obligation is the maintenance of cultural and art sites, many of which have become tourist attractions in the Kimberley Region. The aboriginal homelands movement of the 1970s finally allowed some indigenous groups to return to their traditional home country. The Kimberley today has one of Australia’s highest proportions of aboriginal inhabitants, with nearly half of the region’s population being indigenous. There are about 160 aboriginal communities and 30 different language groups in the area. Despite its successful pastoral industry and the growing agriculture of the region, the Kimberley remains rather sparsely populated today, with less than 40,000 people dispersed over the vast area. This is equivalent to an average of one person per 12.5 square kilometers. There is now more cows than people in the Kimberley. Most residents of the Kimberley are based in the Shire of Broome, where around 17, 200 people lived in 2014. Broome is also the region’s main draw card for tourism. The majority of tourists stay in the area, only a minority ventures further to explore the Gibb River Road and other attractions of the region. Other population centers of the Kimberley include Kununurra, Derby, Wyndham, Fitzroy Crossing and Halls Creek. At Charter North 4WD Safaris, we provide quality interpretation of all attractions and destinations that we visit, including history and some entertaining trivia. We also carry a multitude of reading material on board, so that you can use our travel time to read up on the interesting history of the Kimberley. Find out more about our Kimberley Tours here.